All personal and identifying information are hidden (such as name, photos, email, previous employers etc.) until a candidate gives permission for that employer to make contact. What do profiles look like? Dental Gateway profiles show all the skills and experience of Dental Professionals in a beautiful, easy to read format. Dental Employers can then easily search for the skills they need. All personal information is hidden until the candidate gives permission for them to be shared. Until that point the Employer will only see an anonymous version of the profile. At long last there’s an effective alternative! Dental Gateway is the new way for employers in the dental profession to find the right staff - and for those looking for that ideal job in dentistry. We cut out the middleman, meaning that you don't have to go through standard agencies that can take up valuable time and money, often with poor results for both employers and job candidates. Dental Gateway does things differently. Unlike a typical dental recruitment agency we offer a gamut of benefits - a much wider choice of dental jobs for candidates, and a service for employers which takes far less time to land the perfect position than using conventional agencies. Dentistry recruitment is a fast paced and dynamic sector of the health profession in the UK. 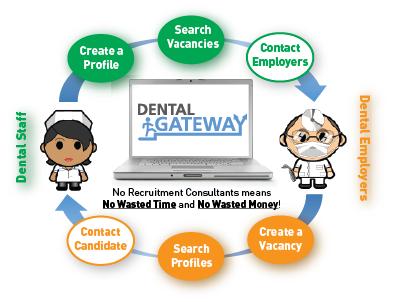 At Dental Gateway we have new jobs offered online every day, many in your own area. Opportunities to find a new position which fits your needs are almost limitless. We update jobs daily so you get fast and valuable results for your efforts with no delays. Remember, these delays can often result in lost or missed opportunities, for both candidates and those looking for the perfect staff to fill important vacancies. You have everything to gain and nothing to lose by registering with Dental Gateway now. It could just change your life!